A Gemmed Satyr (Cyllopsis gemma). Photo taken yesterday - just uphill from the Wambaw Swamp Wilderness in the Francis Marion National Forest in South Carolina. Two Falcate Orangetips (Anthocharis midea) about to mate. Photos taken April 1 at the Tom Yawkey Wildlife Center in South Carolina, USA. Are you doing anything in your gardens to attract the butterflies in? I recently replanted a straggly Buddleia which I hope will now fill out and prosper in its new location. Each year I plant 3 African Blue Basil plants - not for eating but as a fantastic nectar source for butterflies, bees, moths and occasionally humingbirds. They bloom from spring until frost kills them which I try and forestall by covering them when it threatens. 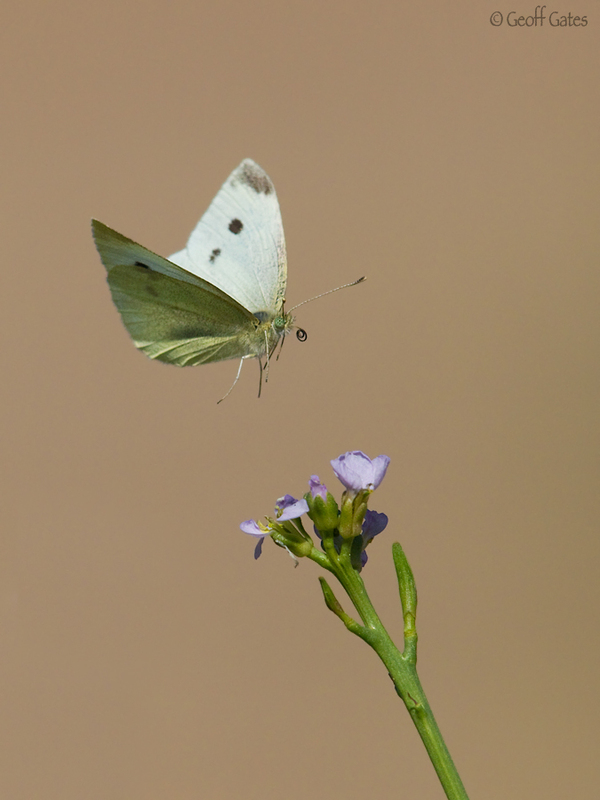 A plain old Cabbage White Butterfly a second or so before landing on a flowering sea rocket stalk. There's the poster for the international airline pilots association. ‘Coming in for a landing’. What you've described as being “plain old” is transformed into wildlife art in your experienced hands. Truly lovely, even if plain and old. Photographed at 8:58 am on 11 February, 2014 at Amboseli National Park, Kenya, using an EOS 1D X camera and an EF 400mm f/2.8L IS II super-telephoto lens. ISO 800, 1/3200 sec., f/5.6, 400mm focal length, handheld Manual exposure. An adult butterfly's life is perilous and wearisome. Despite their cheerful appearance and winsome flight, they must continuously contend with life's inevitable vicissitudes. 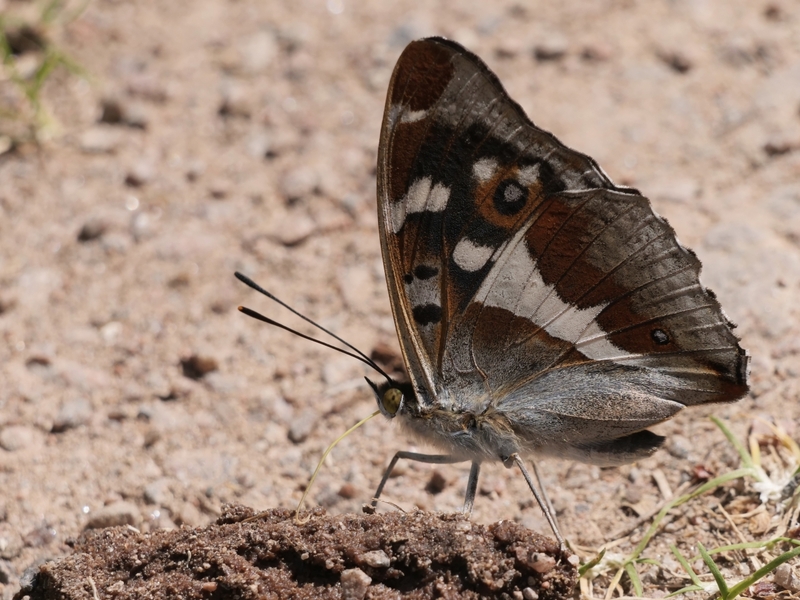 This Hypolimnas misippus, Diadem, had seen better days, as evidenced by a missing antenna and the damaged wings. Withal, a lovely sight to begin the day! 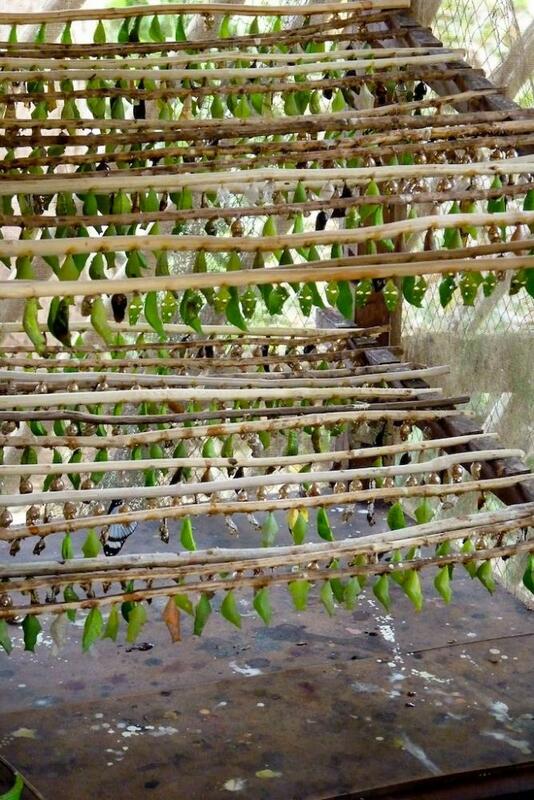 Butterfly pupae being raised at the Zanzibar Butterfly Centre. The centre pays local farmers to collect the pupae. @@Christopher Moran - thanks for sharing. @@Christopher Moran Can you tell us more about the butterfly center? I visited the center back in 2010, so my memory is a little hazy... but would be happy too. It's a little, private enterprise located not far from the Jozani Forest Reserve (where the Red Colobus monkeys can be seen). I've just checked on TripAdvisor, and they are still operating. It really was a beautiful place. You are given a short tour of about 30min or so where a guide explains the biology of the local butterflies, their community project, and then you get to walk inside a very large, netted enclosure (about double the size of a basketball court? ), where they release the grown butterflies. Although it doesn't show up in the photos, the enclosure has a bit of a "Garden of Eden" feel to it, with Zanzibar's high humidity mixed in There are hundreds of butterflies here, of many different species, and you can walk around on your own. The center pays local farmers to collect the pupae, which in turn encourages the farmers to grow certain crops/plants to attract butterflies to breed on their farms. I left with the impression that they were genuine in helping the local communities, even though the center itself does sell some pupae to interested buyers (maybe the farmers get a share of those sales as well?). On their website they mention that one of the center's aims is to encourage local landowners to avoid deforestation of their lands for charcoal production (a common source of fuel on the island). The pupae are "stuck" to the rods with some sort of biologically-safe "super-glue" (! ), and the many pupae are kept in a glass box to protect them from predators. When they are ready to emerge, the rods are transferred to another box, this time in the large enclosure. I was told that those gold dots on the pupae where a natural defence mechanism - they resemble a pair of eyes (I think it was a snake) - to ward off any attackers, although looking more closely at the photo it seems at least one of them has three eyes in a row! It's a beautiful little place, and well worth the visit esp. if you are travelling to Jozani Forest. http://www.zanzibarbutterflies.com/ (it's looks a little out-of-date). That's such a nice explanation — very helpful. The only comparable butterfly house I ever saw was on Sentosa Island in Singapore. 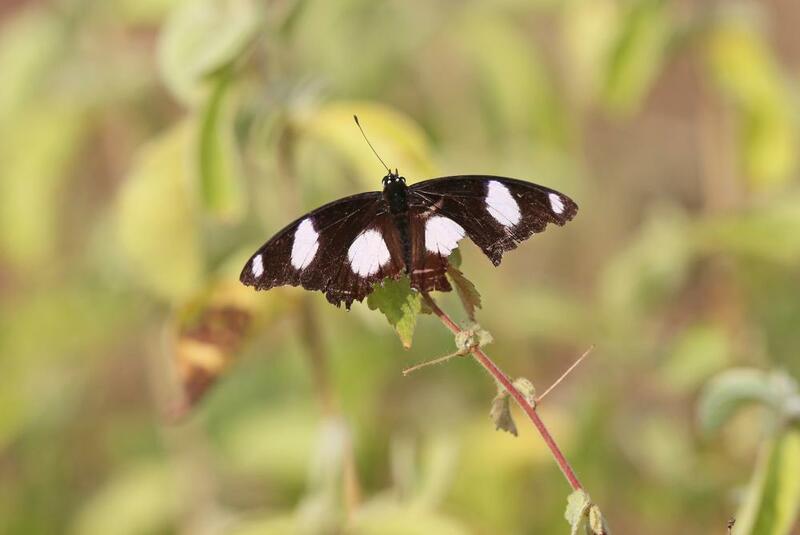 It looks as though the Zanzibar Butterfly House has many species. Thank you for taking time to share this with us! Butterflies photographed on the side of Mt. Rainier, State of Washington, USA, in August. The Silver-bordered Fritillary is feeding on Pearly Everlasting, a wild flower growing along the shores of the Reflection Lakes. The Satyr Comma is a North American butterfly primarily found in Western Canada, where it is locally common. It just wandered a little south. 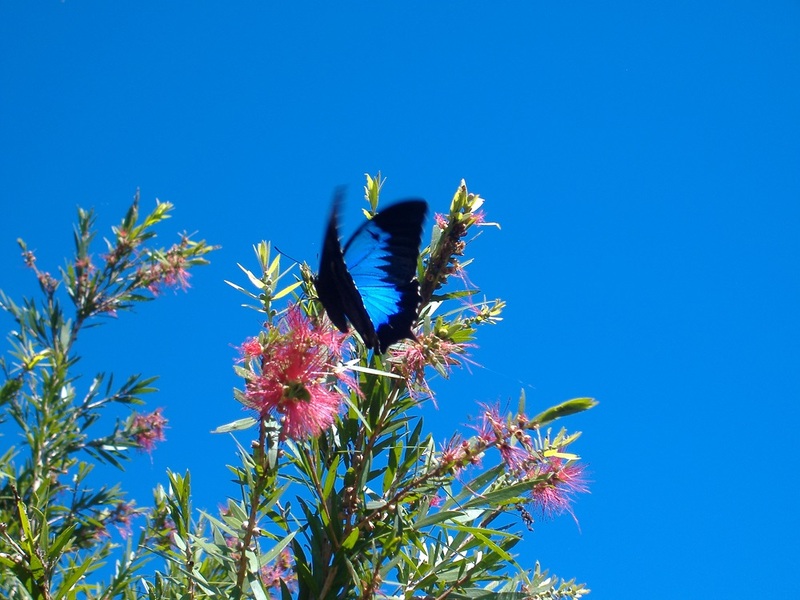 A Ulysses butterfly taken at the Mena Creek Eco Gardens in North Queensland in 2009. A gorgeous garden planted to attract butterflies. Here are a few random shots. 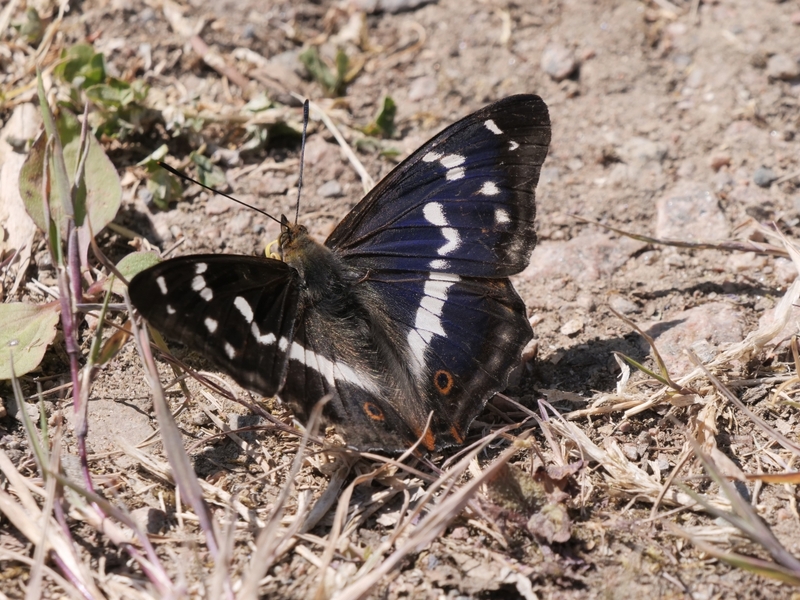 I am really bad at Butterfly identification so feel free to ID or correct ones I have wrong. I've never been to Belize or Central America, thus regret that I'm no help at all for identification. Nevertheless I need to tell you that it's a beautiful photograph at close range! The black and red on the body are especially attractive. One of the biggest in the world with 22cm wingspan. Another amazing creature native to the rainforest in Madagascar. Comet Moth - Mantadia NP - Madagascar. Pipevine Swallowtails look like very different butterflies depending if they are at rest and their wings are folded or not. They are black with bluish-green metallic color on the hind wings. These Pipevine Swallowtails were photographed in July in the Smoky Mountains of Tennessee, USA, which is the only place I have ever seen them. @Patty - the bottom ones look like Monarchs. The similar Viceroy would have a diagonal black line cutting across its upperwings. I saw these two butterflies doing habitat maintenance (yard work) this past Saturday. This is a Clouded Skipper (Lerema accius) nectaring at Pickerelweed flowers (in one of the frog-rearing ponds). Stunning shots Nathan ( @offshorebirder ) ! We just settled for a nice walk! Its called the Purple Emporer because of the purple irridisence and better photo's show this on both wings! And here is one on its favourite mineral supplement-I did not bring it with me! 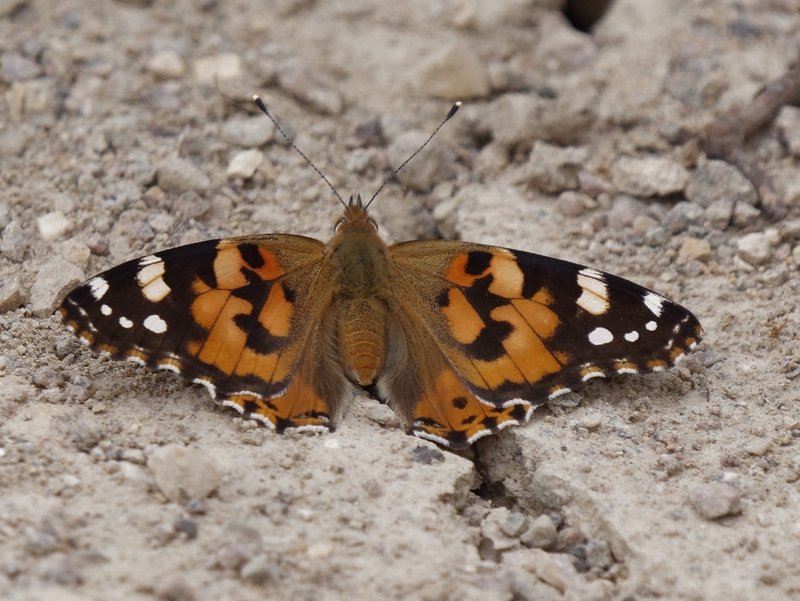 Another Painted Lady. We saw lots of these walking along the Lancaster Canal yesterday. 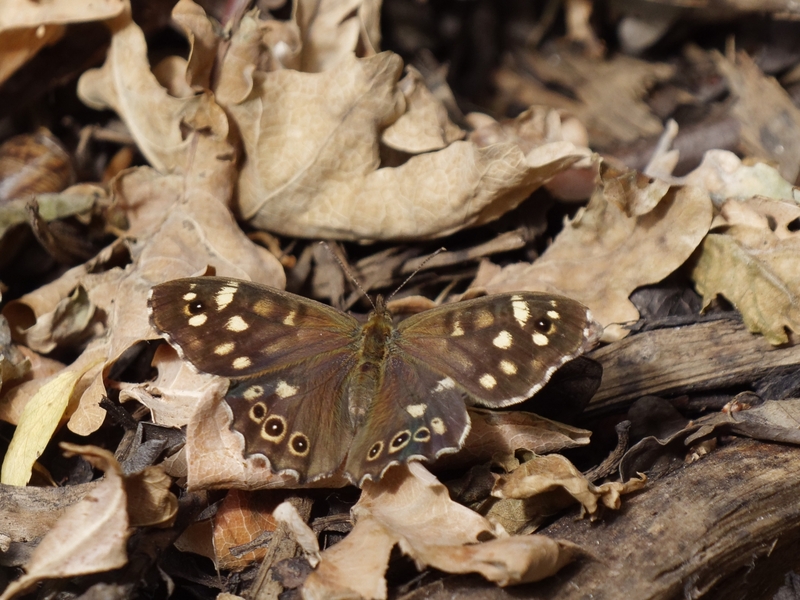 It is a migrant (usually from North Africa) and is one of our larger butterflies.